Have you ever tried to transform your relationship alone? Most people probably would think this is either impossible or terribly unfair. and was eager to try them all. 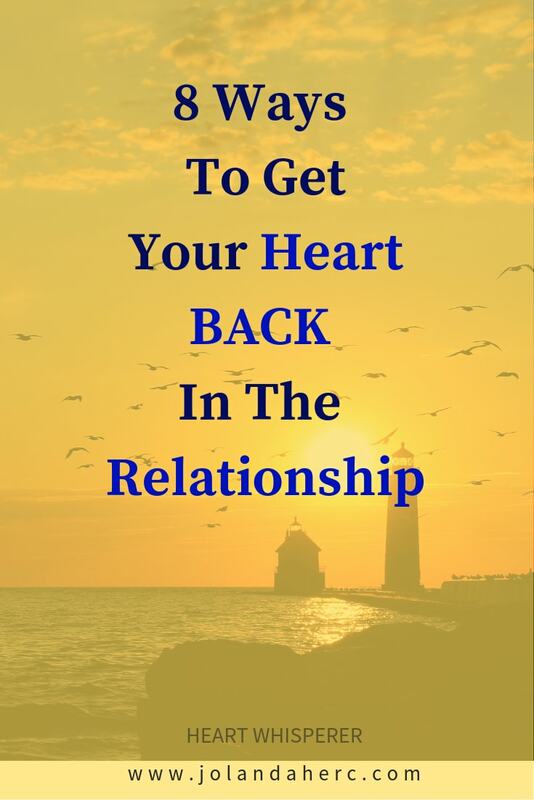 The book is EMPOWERING because it puts the tools for change in your hands – you do not have to wait until your partner changes for your relationship to get better! 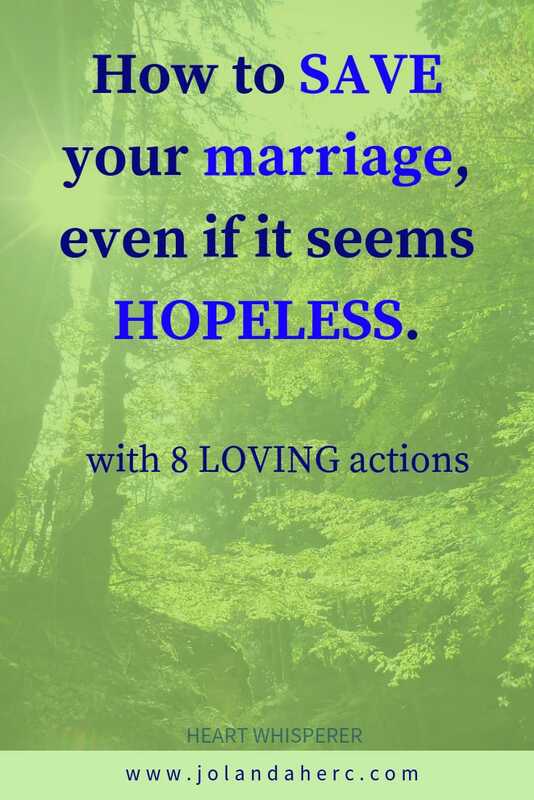 This is my life story HOW I CHANGED MY RELATIONSHIP ALONE- using 8 loving actions. 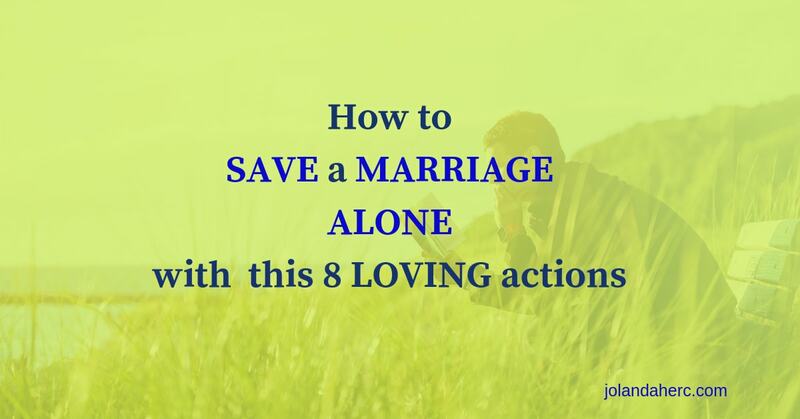 What is so different about the book Why Talking Is Not Enough: 8 Loving Actions That Will Transform Your Marriage? is one of those books that flies against the conventional advice that’s often given when it comes to marriage counseling. But after you get over the “but that can’t be right” feeling, there’s a lot to be said for her approach. But Susan Page argues that if you’re unhappy or not getting what you want out of your marriage, you have a whole lot more power to make your marriage better than you ever imagined. In fact, she makes it clear that feeling that power, that sense of control over the emotional quality of your marriage, MORE than makes up for any feeling of how “unfair” it all is that you’re the one who’s orchestrating the changes. She suggests that communication is NOT the most important relationship skill. Far more important is the ability to take loving actions. 1. 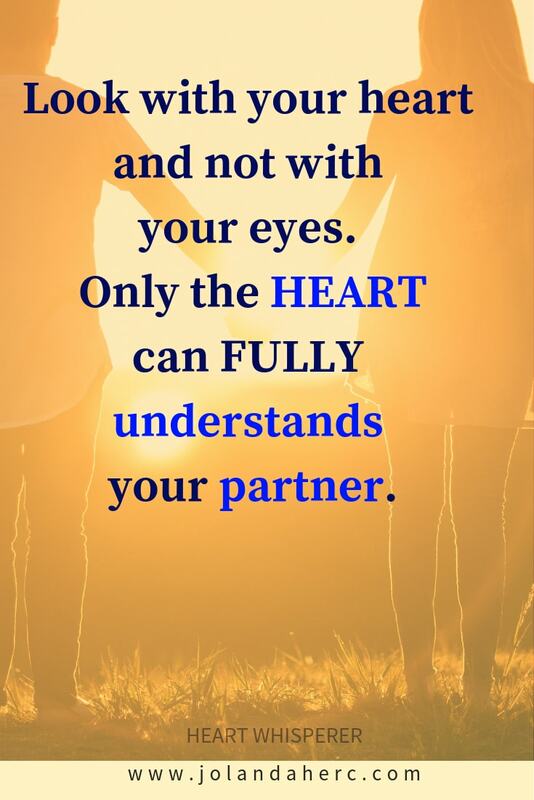 LOVING ACTION- being open to seeing your partner beyond appearance and actions and words. What separate couples who thrive in a relationship from those that don’t? It’s not excellent communication skills or a happy childhood, the stable home environment in childhood is being on the same team and being open to seeing beyond appearance and actions and words. What does being on the same team and being open actually mean? I am on your side, no matter what, I am your ally, not your rival. That means I value our relationship more than whatever problem was caused by this small incident. I am prepared to see that my partner’s different point of view ( or habits that annoyed me) have some meaning for him. seeing the positive side in your spouse. instead of seeing an ideal picture actually seeing him as she is. being generous when you are right but giving up being right to get more love. What if there are some valid reasons why s/he think or act like this? What are our goals as a couple? What is the most important purpose of our relationship for me? When I lost sight of our purpose recently? The answers to these questions help me to stay focused on what is really important in our relationship. To support each other, to enjoy life together, to create more love, to spread it to my child and my daily job. Love, not equality, not who will be right, not my way is the best ways. Not which color will our kitchen be painted, not how successful are we in comparison to my best friend marriage. On the grand scheme of things, how important are they really? Accepting the fact that the love in our relationship does not mean that we will always be our best self. Love is alive, is about accepting that sometimes I have a bad day or minute and sometimes he has the best bad day possible. I stop taking every problem and challenge so seriously. I don’t mean that I did not act on them. But I took them more as a normal part of life. I start to compare my marriage to the marriage of my best friend. I know that I have problems with that in the past. The moment when he hurt me, I closed down, withdraw my loving attention and the air in our home became toxic with resentment, anger, disappointment and hurt. What changed after I start using the first loving action? The money flows more effortlessly in our marriage. There is one small detail that nobody told me, but the less I stop the flow of love, the fewer problems and challenges we need to face in our daily lives. The opportunities for doing meaningful work appear more and more and the children are happier. So instead of thinking will I get what I need in my relationship and from my partner? Will we be equal in every aspect of our life? How could we find the best possible solutions for challenges that came up instead of trying to find whose fault is it and worrying about bad luck? It doesn’t seem like there is a big difference, but I discovered that every minute that we spend worrying or stressing or arguing or blaming or despairing, I lose energy. The love is also a source of the enormous creative energy. Every small act that causes me to close my heart in all that feeling states, close down my source of energy. That’s why money flows more effortlessly in our relationship and it came more from meaningful work than before, when I was just working for money. What was the most difficult part of the first loving action? The most difficult part was to discern if I slipped back into my ‘being nice girl syndrome’ or being a doormat. I have a history of being too nice to everyone instead of standing up for myself. I have to learn to ask for what I need. It took me some time to balance all that. Not to react with fear of being taken advantage of. If you have a long history of being too nice to everyone except you, take this slowly. I have a history of being overpowered by my family members when it was clear that I was right. And I did not have assertiveness and communication skills (better put I couldn’t communicate effectively when I was verbally attacked, that my sensitive side). So being right was important to me. For instance, when I want him to go on regular dates with me and he just went along without any enthusiasm. Then I stop and discover how much things there is that I don’t need to compromise on dates and could turn them into dates by myself. I became more alive, joyful and easier to be around. I wouldn’t discover all that about myself without his lack of enthusiasm about our dates. What helped me to discern, when I am giving up being right (even when I know that I was right) was that I always have at the back on my mind (or on my inner side of the door of the wardrobe) that if I give up being right I will get what I want from him, not exact thing but more love. That helped me tremendously during the recovery stage of ‘nice girl syndrome’. The men could also have that syndrome, trying to get their mother love with being nice and doing everything for her and get love in return. We all have our own ideas about our home, what is cluttered, what needs to be done, when, how it needs to look. And then we get annoyed with each other. I decided to see these things as a little reminder of the love that I feel for him and saw doing that thing as a small love ritual, a secret gift to myself. (Because I felt and received more love in the end because of that). I was sometimes surprised how the problem disappeared or it just didn’t matter to me anymore. Sometimes the most helpful way was asking myself this radical question: What if this is happening FOR me, not TO ME? I start to see his lack of enthusiasm about our dates as something that is happening to me, to bring more love and joy into my life. Not as some need that was not met by him. I discovered how much things I could turn into dates by myself or with one of my girlfriend. Because of that I also became more alive, joyful and easier to be around. In my relationship I continue with that habit of mine, fighting to be right out of fear of being overpowered. But slowly I start to notice that when I give up being right, we both gain. The feeling of love and closeness grow between us. So I try to have that in mind when I am right. What does it really matter in the long run? What I will get if I give up being right? I am much kinder to my spouse and not worrying anymore if I will get my fair share. I am only interested in how love will grow, for what I will make space in my life when I give up being right. Another thing is when I am kind to him and give up being right (or even give up the way to get my needs meet or even give up my needs) I feel differently about myself. I am not in the fighting mode anymore. I don’t have to spend the time to fight for fair share in my marriage. I could relax and be in that relaxed loving space more. You know, how tense it is when you need to take care that your needs are being met. I have to take care of myself; nobody will do that instead of me. When I stop trying so hard to take care of myself, I open up space to receive from life. Surprising ways that my needs are met came around. I don’t have to control life to not be taken advantage of. What is the difference between your partner being dependent on you or becoming a doormat? It is a choice. You choose to act that way, you choose to be generous and that empower you. And it builds your power. And open you up to a different point of view. You would start to recognize that your love and support will help your partner to fulfill your need and have more energy to do that instead of your nagging. You also have a choice to step out of the relationship or say something or stop if your partner is using your generosity to get away with far less work in your relationship then you. When you have no choice and you are a doormat that takes away your power. And that is different. So instead of focusing on having your needs meet, focus on both of you. Instead of trying to be equal, try to love and let the love flow freely and your needs will be meet automatically. It is a challenge to step out of fighting for your rights, to be equal, and maybe you have a bad experience. I did too. I tried and it worked. Would you? Loving Actions replace communication as the primary tool for problem-solving and relationship enrichment. She points out how communication can sometimes be problematic, such as when one partner is better at communicating than the other. Instead of focusing on what is wrong and what needs to change in your spouse or your relationship, you focus on changing yourself and growing spiritually.